Episode LXV: It's a beautiful day!!! I cannot believe it has been over 7 weeks... and it was finally my last day of radiation. I was thrilled that it was the last day that I would have to get zapped... hopefully forever!! Even though I was excited it was a Monday... it also meant trying to get the kids up, fed and to school on time. A chaotic and normal Monday. And by all accounts, it was going to be a very successful day! I completed my normal routine for radiation: I arrived, scanned my ID card, changed into the gowns, and waited my turn. I had seen it throughout treatment, as people get finished new people arrived. It was my day to finish and a few new faces were there today. I was excited to speak and encourage the newbies. Could it be? Was I finished? 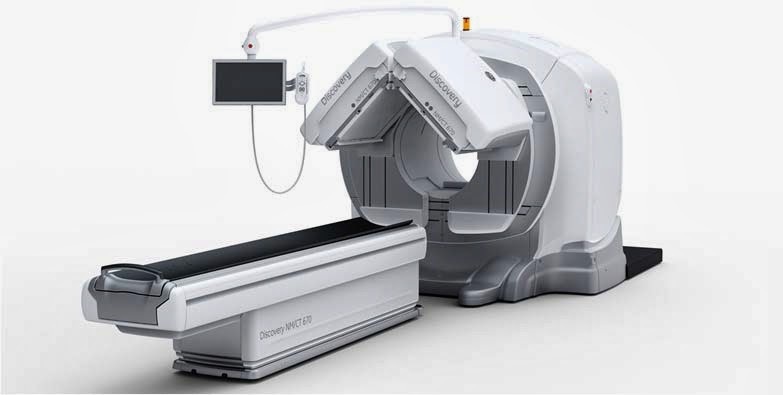 Had I finally completed my last radiation treatment? 35 zaps down.... 0 to go! Then it was over. It was over! I now had the honor to ring the bell. 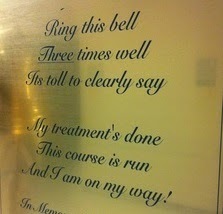 A plaque and bell hang in the hall and can only be rung when someone completes treatment. Today was my day. The bell was a symbol that treatment was over. I had graduated from radiation!!! Ring! Ring! Ring! In an ideal world I would be finished with treatment and finished with my day. But like all cancer patients... normal and ideal was not an option. I left my last radiation treatment and drove straight to the cancer center for further testing. Since I was still having heart related issues the oncologist had ordered more tests: CT scan & MUGA scan. I arrived and checked into the imaging department. My name was finally called and I went back with a nurse to get an IV. After my last crazy IV experience I was nervous, yet pleasantly relieved that today was not as traumatic. Instead it was pretty normal (no blood and drama) except she removed some blood for my MUGA scan. In a moment of quick thinking, I had them go ahead and run my blood work from the IV since I was coming back to see the doctor in a few days. Now I could avoid another needle stick. I was impressed that I had that thought... something that can be a rare and wonderful thing during all these treatments. No really... thoughts and ideas are often lost or... what was I saying?!?! It was finally time for my CT scan. The CT scan was beyond easy at this point. It required very little time and effort. Usually only taking 15 minutes. After lying on my back for radiation, I will say I was less excited about getting down on another hard surface. I held my breath a few times. I felt the warm sensation that I had peed (but I really had not). The machine went over me a few times. I was finished. I get a to use a new machine... here's an example for the MUGA. The multigated acquisition (MUGA) scan basically looks at images of the ventricles (lower chambers of the heart that hold blood) to make sure they are pumping blood properly. After having chemo they wanted to see if any heart issues have developed based on some of my symptoms. Not sure which door is better... Hot Lab or Decay Storage???? Before the scan the nurse retrieved some of my blood from the Hot Lab room and re-injected it into my IV line. My blood had been mixed with some radioactive material and then put back in my arm. 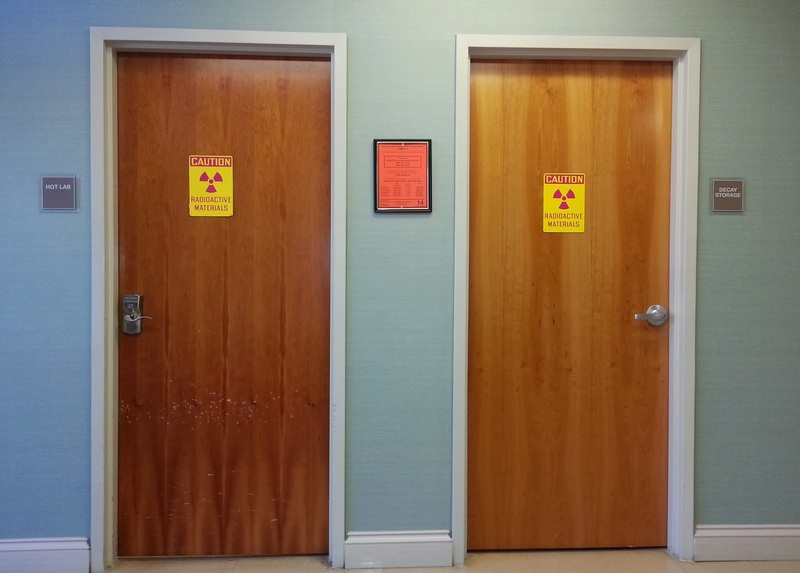 I have now had radiation and got double doses of radioactive material... why do I not glow??? Then the tech put electrodes on my chest to monitor my heart’s electrical activity during the test. Once again, I was laying down on a hard surface and remaining still. A large camera was placed very close to my chest... very close and then gamma rays tracked the tracer in my body. Did I mention that it was very close to me? I had to lay still for around 30 minutes. Then she moved the camera and took more images for 30 minutes. Of course, one of my two scans was unclear so I got an additional 30 minute scan... bonus!!! My back was extremely sore from laying on the hard tables all day, but I was finally done. 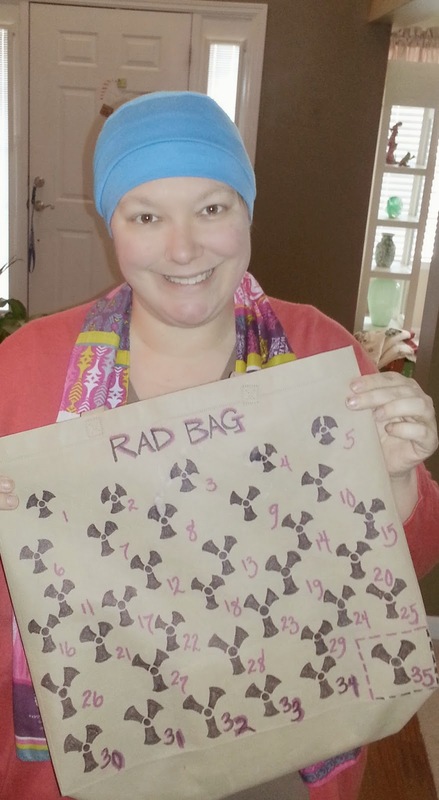 It was my last day of radiation. It was another day of scans.... which was something that will always be part of my life. I cannot believe I have finally come to the end of my treatment. 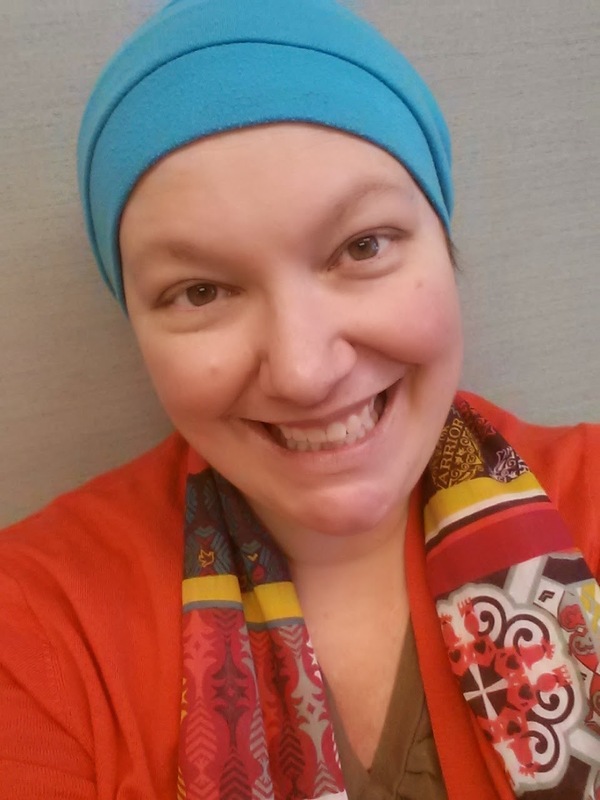 I have endured months of chemotherapy, multiple procedures/surgeries, and finished radiation. Almost 1 year of torturous obstacles. I have endured. I have fought. I have survived. 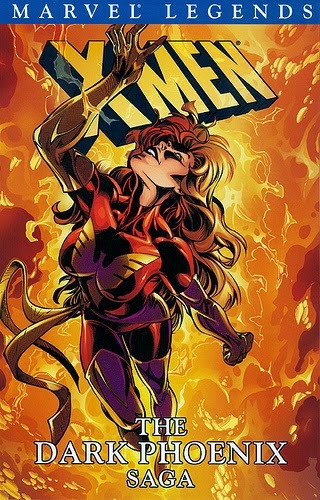 Maybe not a dark, but happy Phoenix?!?! I am so grateful to all the people who have given me such great care and support. I have spent almost every day with my techs and will really miss our witty conversations and silly laughter. I have found such joy in the staff and people I have met throughout my cancer journey. What an amazing day... what a beautiful day! “I am the happiest creature in the world. Perhaps other people have said so before, but not one with such justice.